Classical authors and archaeological finds paint a fascinating picture of Celtic banquets. Even allowing for the exaggeration common to classical depictions of the ‘barbarians’, enormous vessels like the Vix Krater or Gundestrup Cauldron, attest to the immense scale and lavishness of some of these occasions. At Vix, where the Celts settled in the 6th century BC, a fortress was erected, and in a circle of around 10 km. are dotted dozens of burial sites. On the southern side of these mounds the most spectacular tomb, that of the Lady of Vix, was discovered in 1953. 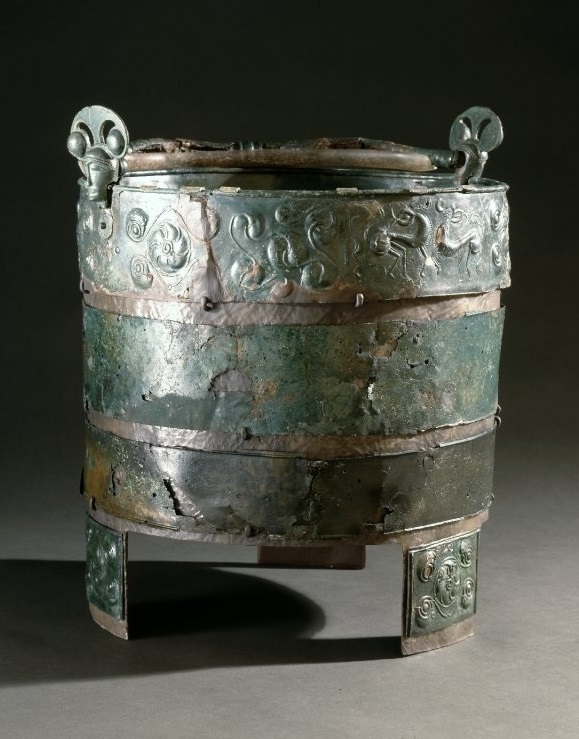 The Celtic Princess was buried with a number of remarkable artifacts including a magnificent bronze krater of Etruscan or Greek origin, 1.63 m. in height, weighing 208 kg., and made to contain 1,100 liters (290 gallons) of liquid; it is the largest known metal vessel from antiquity. 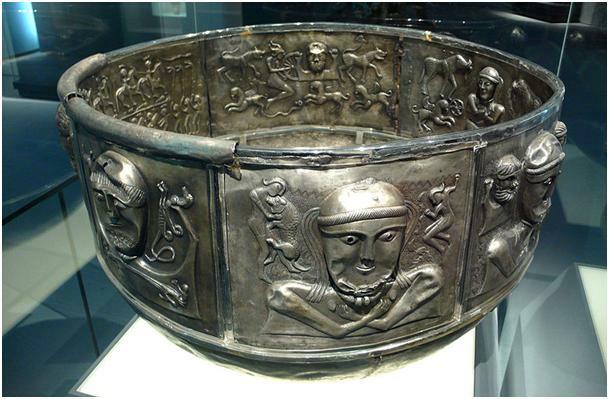 Made by Thracian craftsmen for the Celtic Scordisci, the Gundestrup cauldron is the most spectacular of Celto-Thracian artifacts, and the finest example of late Iron Age European silverwork. In terms of archaeological data, particularly interesting is recently published archaeobotanical evidence for beer-making in southeastern France, which confirms classical accounts of the importance of beer among the Celts. An archaeological sample from a fifth century BC Celtic house at the site of Roquepertuse produced a concentration of carbonized barley (Hordeum vulgare) grains. The sample was taken from the floor of the dwelling, close to a hearth and an oven. The barley grains are predominantly sprouted and the assemblage represents the remains of deliberate malting, related to beer-brewing. An oven was discovered nearby which was used to stop the germination process at the desired level by drying or roasting the grain (Bouby et al 2011). 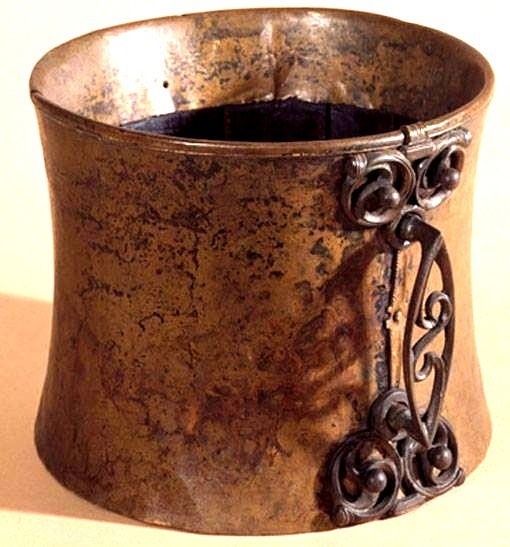 Celtic tankard of wood (yew) and bronze discovered in a bog at Trawsfynydd (Gwynedd), Wales (ca. 50 BC). 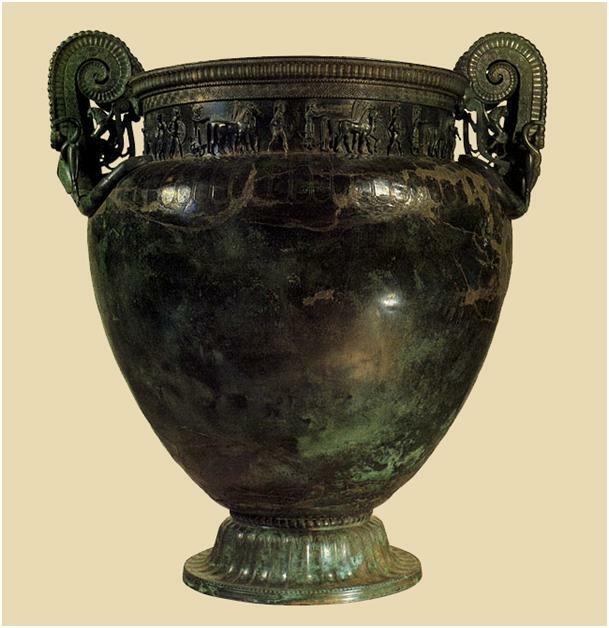 The cast bronze handle of the vessel is decorated with triskele motifs, indicating that it had a ceremonial/religious function. “Sometimes wounds are inflicted, and irritation caused by this may lead even to the slaying of the opponent unless by-standers hold them back” (Ath. op cit). “And it is their custom, even during the course of the meal, to seize upon any trivial matter as an occasion for keen disputation and then to challenge one another to single combat, without any regard for their lives; for the belief of Pythagoras prevails among them, that the souls of men are immortal and that after a prescribed number of years they commence upon a new life, the soul entering into another body”. 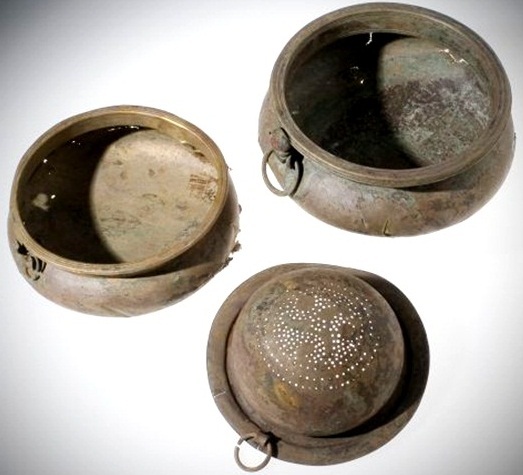 This sort of receptacle, with a capacity of 3-5 liters (6-9 pints), formed part of a drinking service for wine, which was imported in quantity and drunk during feasts, probably linked to religious ceremonies. The Celts also ‘exported’ their beer to Thrace during the eastern expansion of the 4th/ 3rd c. BC, and the fact that the liquid nectar was ‘worshipped’ among the Balkan Celts is testified to in the name of the local God (epithet of Apollo) – Κυρμιληνός – in an inscription from Ezerovo, Bulgaria (KDP 236; Detschew 1957:271), the Celtic epithet of the Greek God being yet another example of the synthesis of cultures in Thrace during this period (Detschew op cit.). Besides Κυρμιληνός, the element also occurs in many Celtic personal names such as Curmillus, Curmissus etc. (Holder AC 1: 1203), indicating that these individuals were probably brewers by profession. Bergquist A.K., Taylor, T. F. (1987). The origin of the Gundestrup cauldron. In: Antiquity 61: 10-24. Haywood J. (2004). The Celts: Bronze Age to New Age. Kruta V. (2004)The Celts – History and Civilization. Meid W. (2005). Keltische Personennamen in Pannonien, Archaeolingua, Budapest. Taylor T. (1992). The Gundestrup cauldron. In: Scientific American, 266: 84-89.